It is a beautiful day to begin painting trim on the Mercado. 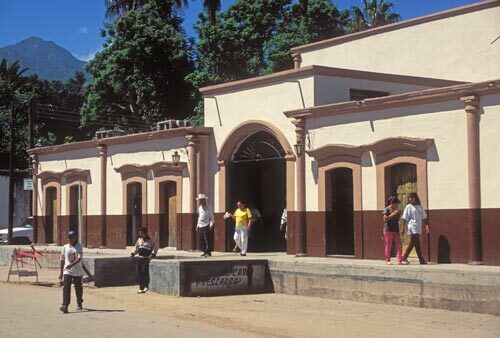 I met the Mercado on my first visit to Alamos in the Spring of 1984. It was an unpainted shell surrounded by vendors displaying their wares on side streets: narrow busy bazaars under collages of tarps, blankets and open sky. I was told it had been like this for awhile as frustration grew over unresolved issues that would not allow businesses to move inside. The Mercado was open when I returned in the Winter of 1993. I have a memory that some of the stall areas were empty at the time. 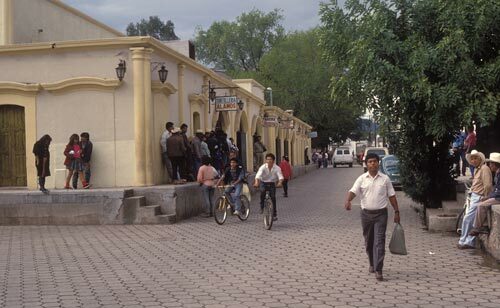 On this Summer day of 1996 the Mercado was filled with retail and food businesses. A painter was at work with his trim brush, a produce truck unloads and customers came and wento as a street sweeper looked for trash to remove. 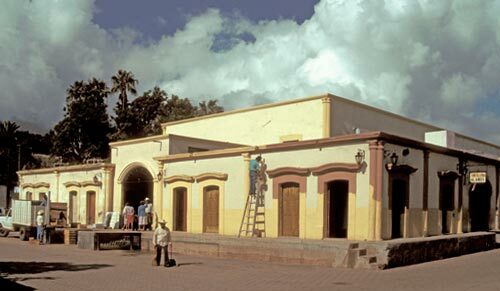 Sierra de Alamos rises regally above the freshly painted Mercado. A common occurrence on all my visits to Alamos was someone painting something somewhere, everywhere. Here, the Mercado looks as if it has been repainted, again, Climate, dust and automobile exhaust are several of many contributing factors for new paint jobs. 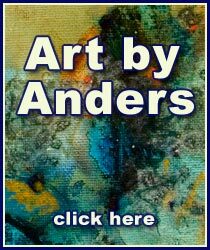 Paint, besides adding color and newness, is another layer of skin protecting the past from flaking off with the elements. Paint is labor intensive and provides needed work in challenged economies. Paint is good. Is this another color scheme or has the paint faded? The Mercado has stores with exterior doors along its outside walls and four entrances into an enclosed open space with a two story ceiling. The large space is divided into stalls selling everything from cowbells, school supplies, clothes to boom boxes. Fresh produce, canned and dry goods, breads and meats fill the floor. Voices, music and aromas bounce off walls. Friends buy from friends, and family, as children and dogs navigate the aisles. Several counters serve hot food. Small tvs, up high on shelfs, entertain no one in particular.